The 1970s were a devastating decade for New York City. The middle class and employers fled, leaving the old, poor, unemployed and troubled behind. The city lost hundreds of thousands of jobs and nearly a million people. Today, however, the population has soared. Cranes dot the skyline as tens of thousands of housing units are under construction to accommodate the hundreds of thousands of people trying to more here. Total private employment, for which the 1969 peak was a seemingly insurmountable barrier for decades, has soared past that level to previously unimaginable heights. Self-employment has soared even more. And with suburban housing increasingly occupied by retired empty nesters rather than young workers, more of those jobs are held by city residents, and the city’s employment-population ratio is at an all time high. The only problem, it seems, is that real estate values are soaring as a result of gentrification, and the poor are being pushed out of the city. To find out to what extent, I took a spreadsheet I had produced years ago, with decennial Census of Population data on poverty in 1969, 1979, and 1989, and added 2014 American Community Survey data to it. And then compared data for 1979, near the city’s low ebb, with data for 2014, the most recent year available. I found that the number of non-poor people (for whom poverty status could be determined) had increased by over 1 million (18.6%) over 35 years. And the number of poor people, rather than decreasing or staying the same, has increased by more than 350,000 or 25.5%. An even faster gain. Are you surprised? I am. The spreadsheet, with charts for the rest of this post, is attached here. The table is set up to print on three pages, but I’m not sure what your spreadsheet program will do with it. The data show that New York City’s poverty rate was 14.9%, not much higher than the U.S. average, in 1969, but 20.0%, much higher than the U.S. average, in 1979. With some variation it has been in the vicinity of 20.0% ever since, and was at 20.9% in 2014. The gap with the U.S. average is smaller today not because NYC’s poverty rate had gone down, but because the U.S. rate has gone up. And given that the U.S. poverty rate has gone up, and the world is full of people who are poor by New York City standards (when the Pope talks about poverty, he isn’t talking about people in NYC housing projects), why am I surprised that the number of poor people in NYC has increased by a third of million since the 1970s? The number of poor people in the U.S. increased by nearly 21 million (76.0%) in 35 years, while the number of non-poor Americans increased by just 35.8% (69 million). At the national level the number of poor people is a function of economic changes and changes within families, not what goes on in a mere locality. And economic advances in the rest of the world have created a global middle class that is poor by U.S. standards, and turned them into world travelers. Clearly some of these poor people from elsewhere in the country, and elsewhere in the world, are going to want to come to New York City. They always have in the past. I am nonetheless surprised at the rising number of poor people in NYC, compared with the dark days of the 1970s, because I believed that at the local level the number of poor people depends on the number of places for them. That’s why the suburban equivalent of an antipoverty program is zoning out everything but one-family housing, preferably on large lots. To keep the poor, their problems and their fiscal burdens away. New York City, in contrast, has done more than just about anyplace else in the country to accommodate and house the poor. Even so, however, the number of government-controlled places for the poor has not gone up much for the past 35 years. And I assumed that any increase in private housing affordable to the poor in outlying areas of the city, as the housing units reached 50 years of age and were passed down, would be offset by “gentrification” closer in, creating a wash. I therefore expected that the number of poor people in the city would stay about the same, with the city’s poverty rate falling as the number of non-poor people living in the city went up. 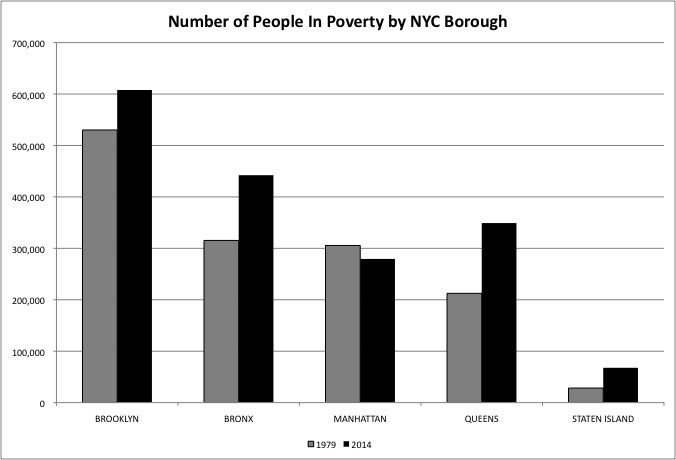 Looking at the number of poor people by borough, it did fall in Manhattan over 35 years, but by a mere 26,150 (8.6%). The increase in the number of poor people living in the “middle class” “suburban” boroughs dwarfs this, with increases of 39,400 (138.8%) in Staten Island and 136,570 (64.3%) in Queens. There were also substantial increases in the number of poor people in Brooklyn (up 77,750 or 14.7%), the poster child for gentrification, and the Bronx (up 132,680 or 16.1%), a place where poverty was already so high one would expect it wouldn’t go any higher. The number of non-poor people also increased across the city, but Manhattan and Brooklyn were the only boroughs where the poverty rate actually went down. From 24.0% of Brooklyn residents in 1979 to 23.4% in 2014, an insignificant decrease, and from 21.8% to a still-high 17.6% in Manhattan. The poverty rate increased substantially in the other three boroughs over 35 years, while also increasing a in the rest of the New York Metro Area (as defined at each point), the portion of the Northeast region outside the NY metro area, and the rest of the U.S. outside the Northeast. While the poverty rate has soared in Staten Island and Queens, it remains lower than the rate for the part of the U.S. outside the Northeast. In the 1970s the exemplar of urban poverty was a single mother with children on public assistance. 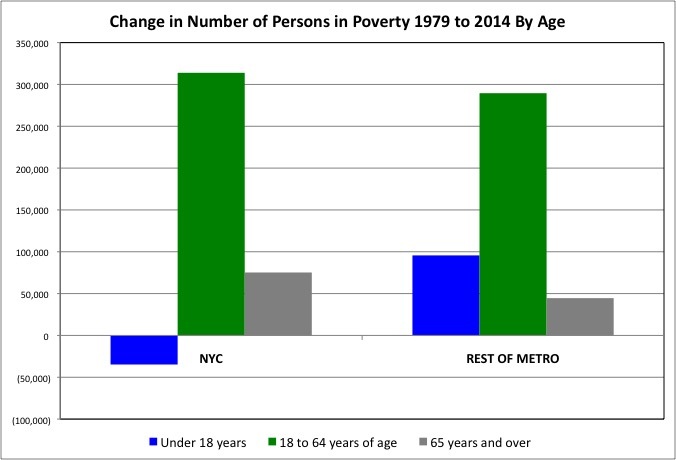 Between 1979 and 2014, however, the number of children living in poverty decreased by 34,800 (6.2%) in New York City while rising by 95,650 (35.0%) in the rest of the Metro Area (aka the suburbs, although there are urban areas within it). Meanwhile, those NYC single mothers and absent fathers from the 1960s through the early 1990s are now getting older. As a result the number of people age 65 years and older living in poverty increased by 75,230 in New York City and 44,560 in the suburbs. As the “welfare generation” moved out or died off, I had expected the number of NYC residents living in poverty to perhaps decrease, as I explained here. Instead the number of non-elderly adults who are poor has soared by about 314,000 (44.6%) in New York City (and 289,500 or 82.5% in the suburbs). Basically, working age adults are pouring into metro New York in general and New York City in particular. Many are finding work but some remain unemployed, and many of those working are doing so part-time, or as self-employed “independent contractors” without steady pay. These are poor adult workers, and the number of them is increasing throughout the country. Young workers still arrive in New York City from other countries seeking a better life. Now, however, they are also arriving from other parts of the U.S., fleeing from broken homes and depressed local economies, seeking to avoid a worse life. The 2014 American Community Survey poverty data download from the U.S. Census Bureau (using American Factfinder) is here. 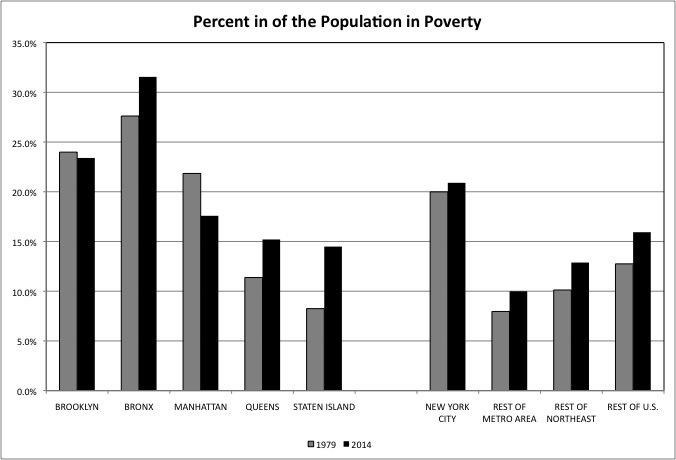 It shows that among New York City’s poor people in 2014 were 349,000 non-Hispanic Whites and 160,500 college graduates. The poor included 353,150 people who were employed (159,500 men and 193,660 women), compared with just 136,500 who were unemployed. It included 122,730 full-time, year round workers, along with 312,700 people who were able to work just part time or just part of the year. If she were included in the American Community Survey, New York City’s poor would likely include the young woman I met last weekend who was working as a cashier at the local supermarket. She recently moved here from Northbrook, Illinois, a suburb of Chicago with a poverty rate of just 3.8%. The poor of Chicago, on the other hand, would likely include my own daughter, who is working for a Catholic education organization for room, board and a small stipend. That sort of temporary poverty among the young is more a blessing than a benefit – get used to being happy living with less, rather than living large and facing downward mobility. Except that for many young people having lower incomes, compared with prior generations at the same age, isn’t likely to be temporary. While New York City’s children, those under age 18, are less likely to be poor than in 1979, they are still more likely to be poor than the U.S. average at 29.6% compared with 21.7%. The share of children who are poor has increased in U.S. as a whole, however, from 16.0% in 1979 to 21.7% in 2014 — as a result of lower wages of younger generations and the ongoing fragmentation of families among the non-college educated. In the rest of the NY metro area the share of children who are poor increased from 11.3% to 14.2%. Because New York City’s working age adults were more likely to be poor in 1979, its seniors are more likely to be poor in 2014. The share of the city’s seniors living in poverty increased from 14.4% in 1979 to 19.3% in 2014. Nationwide, on the other hand, the generation now over or approaching age 65 is the richest in the U.S. history, better off than those who came before or after. The share of those age 65 and over who were living in poverty fell from 14.8% in 1979 to 9.5% in 2014 in the U.S. as a whole, and from just 8.9% to just 7.7% in the rest of the NY Metro area outside NYC. The generations following Generation Greed are worse off. The poverty rate for those 19 to 64 years old increased from 10.3% to 14.6% in the U.S., and from 6.3% to 9.0% in the rest of the NY metro area. 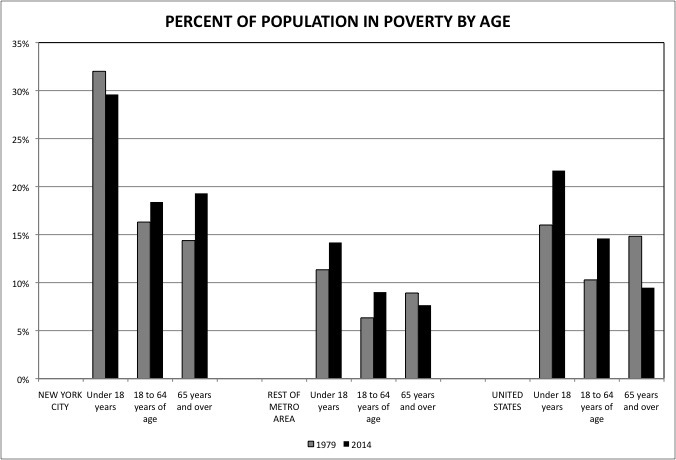 What is surprising is that the poverty rate for working age adults increased from 16.3% to 18.4% in New York City. This surprised me given the huge decrease in the number of city residents on public assistance and the huge leaps in employment. One might think of concentrated poverty as what you find in the places left behind. The upwardly mobile, and young workers, move to growing, dynamic areas, leaving the less capable, older, poorer, and more resigned in the places they are leaving. In the first half of the 20th century that meant poor rural areas, as Americans moved to the cities in search of a better life. In the second half of the 20th century that meant older cities, which people fled on their way to a better life in the suburbs. As the suburban housing stock ages, and young people more to gentrifying cities, this pattern would predict the “suburbanization” of poverty. And there has been much discussion of this phenomenon in the past few years. Apparently, however, it isn’t just the non-poor who are mobile and seek to move to places with greater possibilities. 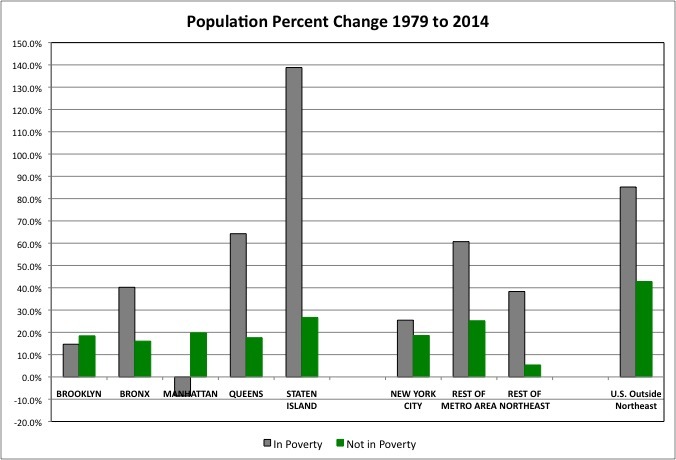 Among New York City boroughs, as previously mentioned, over the 35 years from 1979 to 2014 the number of poor people only fell in Manhattan. And Brooklyn is the only other borough where the number of non-poor people increased faster than the number of poor people, by 18.4% to 14.7%. In the Bronx, which is recovering from the abandonment of the 1970s, the number of non-poor people increased by 16.1% over 35 years, but the number of poor people increased by 40.2%. The overall population continues to hit new highs in Queens and Staten Island, but the increases of 17.6% and 26.7% in the non-poor population are far less, in percentage terms, than the increases of 64.3% and 138.8% in the number of poor people in those boroughs. Though rising from a low base, the increase in the number of poor Staten Island residents has been associated with a soaring heroin addiction problem there. A common problem in the suburbs these days, some report. Where, however, are all these poor people living? They aren’t all homeless, although some are. Here is what I didn’t expect. At the national level, as a result of excess investment in housing over the past 35 years, Americans have far more space per person than they need or can afford. It would be fairly easy to subdivide large suburban McMansions into apartments and create all the affordable housing this country needs, were it not for local government regulations that prohibit this. There is no affordable housing problem, unless it is government regulation-created or people insist on living in particular places rather than the places they could afford. Such subdivisions, in fact, are exactly what happened in places like Brooklyn in past, when the borough was getting poorer. Take this article about a controversy in Bedford Stuyvesant from the mid-1930s. Colored folks, the story appeared to be saying between its lines, were breaking up these former one-family homes and renting out floors and rooms to boarders – presumably other “colored folks,” and creating overcrowding conditions in the neighborhood. While the United States in general is over-housed, New York City is not. In the U.S. as a whole 60.0% of all housing units had three or more bedrooms, with many of those bedrooms unoccupied in housing units owned or rented by aging couples whose children have left. In New York City, on the other hand, only 28.8% of all housing units have three or more bedrooms. And 7.4% of all housing units have no bedroom at all. And yet, an extra 354,400 poor people were able to live in New York City in 2014, compared with 1979, by squeezing into less space. With more than one person per room, more than one family per housing unit, undocumented units in what had been one- or two-family homes, whatever it takes. In the 1960s, people older than me might recall, college graduates moving to New York City might have felt disadvantaged if they had to live in an apartment on the upper floor of a walk-up apartment in Manhattan. When I moved down to the Bronx from Yonkers in the mid-1980s, I shared an apartment with three friends, each of us in our own room. For young college graduates today, the likely response would be “you had your own room?” It is as if Monty Python’s Four Yorkshiremen sketch is running in reverse. If they are desperate enough to live in New York City, Americans can in fact live in much less space than most Americans are used to. In part by being willing to share with strangers, as difficult as that often is. In part by having less stuff, which also saves money. By teaming up and sharing the burden, a large group of poor working people can afford as much rent as a smaller number of non-poor people. And that is what is going on. As for immigrants, space expectations per person are much lower in large cities overseas, even in developed countries in Europe and Japan let alone in places like South America, India Pakistan, Korea and China. So it shouldn’t be surprising that more and more people are packing into less and less space. After all, space per worker has plunged in commercial office space, with many workers looking back fondly on the days of the cubicle. If you have less stuff – less paper – you need less space. I guess that works in housing too. One has to wonder how elastic the city’s housing stock is, and when it will reach the breaking point. Some empty nesters in the part of Brooklyn where I live have taken in young borders. Something I briefly considered myself before watching the movie Fort Tilden, which was set in Brooklyn. Every available space is filling, from the extra seats (and sometimes standing room) on off peak subway trains to the extra rooms in outer borough homes to the supposedly extra storefronts on outer borough commercial streets, and the upper floors of supposedly obsolete outer borough loft buildings. And yet you don’t hear much of the same conflict that was sparked decades ago by this. Even as the poor branch out to the suburbs, often to take jobs. And there is little appetite for enforcing zoning and building rules in the city, if poor people would end up on the street as a result. Given what has happened over the past 35 years, one has to conclude that for New York City reducing the number of poor people by helping people move into the middle class is not a realistic goal. If the city and state were to do less for low and moderate income households, perhaps because of a fiscal crisis, even more of them might fall into poverty. But if the city and state were to do even more for low and moderate income households, more such households would move here to take advantage, joining in with everyone else. The only way the number of poor people is going to go down in New York City is if poverty disappears from planet earth. And that isn’t likely anytime soon. Maybe reducing poverty is the goal of those who want to be separate from the poor, rather than be confronted with them, rather than caring about them. Kind of like the people whose self image would be harmed by riding on a bus. So what is a realistic goal? Improving the way poor people live. Are they decently fed, with access to clean water? Is their health reasonably good? Do they have the opportunity to get an education, and find jobs? Do they have access to affordable transportation, recreation, and entertainment? Are they safe? Perhaps rather than concerning itself with the poverty rate, the city and state should concern themselves mostly with how the poor live. So far the answer is that they must live well enough, because they keep showing up. Whether this can continue, given the debt and pension burdens from the past and the rising total compensation of those who work for the government compared with those who pay for them, remains to be seen.